For those who aren’t aware, this Saturday UFC will host their 158th title fight, and like the previous times, it will be streamed on the Xbox 360. Of course, it’s a pay-per-view event, and as such, it will cost a hefty $44.99 (SD) or $54.99 (HD) to participate. Still, the event is SmartGlass enabled, meaning you can use your Windows Phone, Surface or Windows 8 computer to “augment” the experience. That should be a lot of fun, and you can read more on that on the official site. 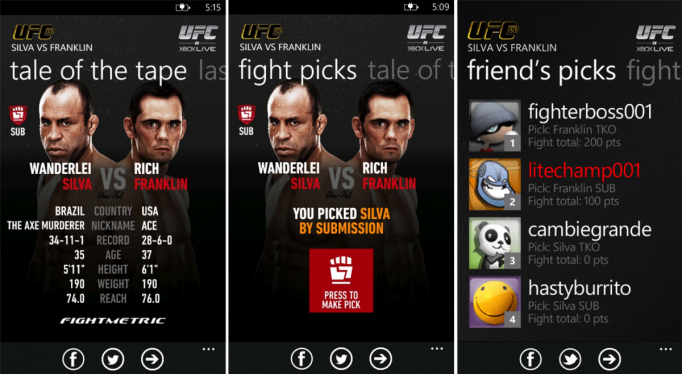 Here are a few other apps that you may want to pick up if you’re into mixed-martial arts (MMA) and the UFC. The official app for Windows Phone is where to start. While the app has not had an update since its release (in September, 2012), and it can be painfully slow to load, it’s still a novel experience. The app basically allows you to view the ‘interactive fight cards’ including who’s who, tale of the tape, last 5 fights, community pick (to win) and your friend’s picks. You can see that last bit of info because users can select which fighter they think will win by simply sliding over the raised fist, including whether it will be submission, TKO or decision. Once your selections are made, you can then share your prediction on Facebook or Twitter. It’s kind of a neat “social” aspect of the sport and being able to see your friends’ predictions is also compelling. But that’s all there really is to the app, and we hope that it gets an update soon with some new features. Seeing the solid relationship UFC seems to have with Microsoft, we hope that’s a doable request. You can pick up UFC on Xbox Live here in the Store. All Windows Phones. There aren’t too many MMA/UFC apps that are worth their salt but MMA UnderGround by Rudi Grobler is pretty solid. It comes with no-ads for $0.99 and a free trial. It’s basically a newsfeed from www.mixedmartialarts.com aka the go-to source for all big news in the sport. Though it’s billed as an unofficial app, it does quite a good job of bringing that site’s content to your Windows Phone in a very streamlined fashion. Featuring a new “Modern” design, the app has a News section with story feeds, Gallery for images, Social for Twitter interactions and even Forum access. It’s all very nicely formatted for your device and even has a Live Tile featuring the latest image and article. Unfortunately, there is no separate video section, which is a bit of a shame. 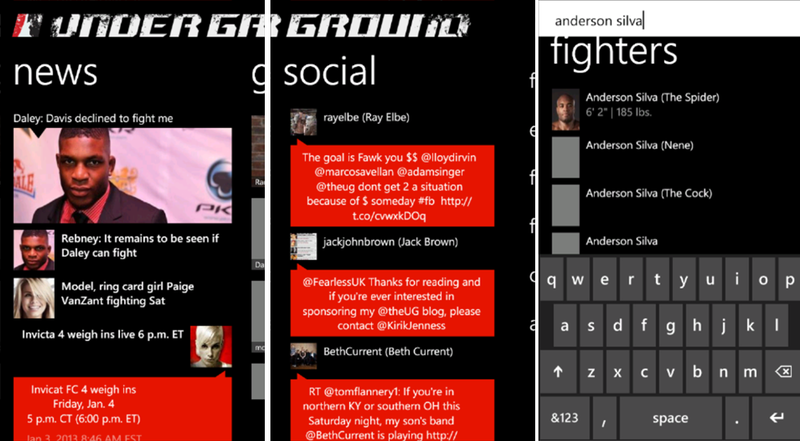 There are no major Windows Phone 8 optimizations yet, though it does support a double-wide Tile. The developer has also been fairly aggressive with updates, including if there are any bugs or glitches. This is our go-to app right now for MMA, and you can grab it for $0.99 here in the Store. All Windows Phones. This is a free app of the same nature as MMA Underground in that it too brings in the feed from www.mixedmartialarts.com. It’s a lot simpler than ‘Underground in that users just scroll over for various sections, including News, Events, UFC Videos, Gallery and More. In that sense, you almost feel that MMA Live gives you more of the site than MMA Underground. Likewise, MMA Live does feature a Live Tile that updates with the latest image and news with the ability to support double-wide Tile as well. 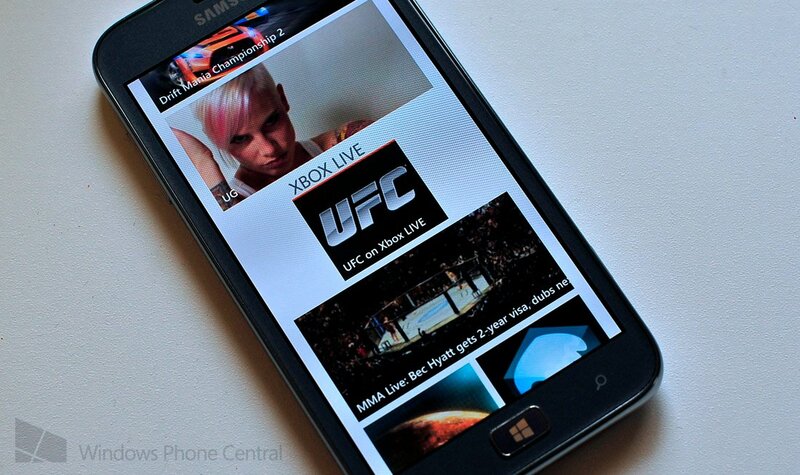 Indeed, the MMA Live Tile is slightly better as the image pans around the screen, adding motion to your screen versus the static image of MMA Underground. The only downside is the app is it is ad-supported, meaning some precious screen real-estate is used up. Of course, the plus side is that the app is free and depending on how often you’re using the app, that $0.99 versus free will be crucial. The app was last updated in December and the developer doesn’t release as many update, but we can’t really complain here too much as nothing is obviously missing. You can pick up MMA Live here in the Store for free. All Windows Phones. 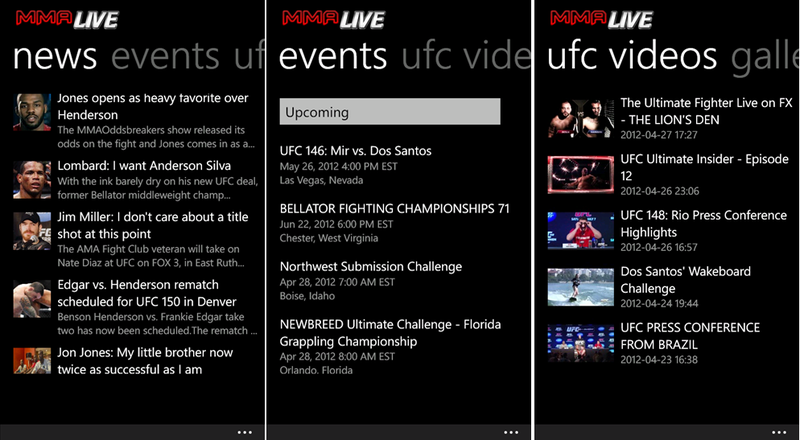 In the end, we’d still prefer some official solution for UFC and MMA on Windows Phone and while the UFC app is a great start, we can certainly seem room for growth. There are other apps out there too, like MMATorch, based off of that site (www.mmatorch.com) which could be good someday but right now it is just a ‘wrapper’ app that looks quite terrible on a Windows Phone. Do you have a favorite UFC or MMA app that we missed? Share with us in comments. Oh and we’re calling this Saturday’s fight as GSP by submission and Hendricks by TKO. Agree, disagree?